Using an extremely simple text, the author of several informational books for the very young--on such subjects as wheels, airports, and boats--takes on the animal world with a look at a favorite topic: "A long time ago. . .There were dinosaurs with horns and dinosaurs with spikes." 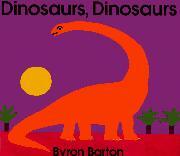 Each beast mentioned is represented in glowing, solid, unrealistic color (e.g., an orange dinosaur against a flat pink sky; a bright green tyrannosaurus against a red volcano erupting pink smoke); but the effect is not only striking but conveys a genuine, if very elementary, sense of these long-ago beasts. Scientific names and their pronunciations are given on the endpapers.